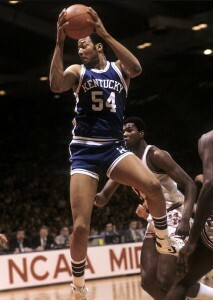 Kentucky's Mel Turpin kept the Wildcats in the game with 18 points. During the break, Crum told his kids that Kentucky had played as well as they could play, and that with increased pressure defensively, the Wildcats would fold. His players listened. After a couple of baskets early in the second stanza, including center Melvin Turpin’s hook shot to make the score 43-32 with 16:38 remaining, Kentucky began to fumble the ball. The Cardinals’ swarming defense – called “denial” by Coach Crum – got their athletic and skilled players running. In a two-minute blitzkrieg, Louisville forced five turnovers, outscored UK 12-2 and cut the Kentucky lead to just three, 45-42. A few minutes later, Cardinals guard Lancaster Gordon found the net on a fast break and Louisville had its first lead at 50-49. Stunned, Kentucky wavered. The Cardinals just kept coming. Louisville stretched the lead to 58-50. But when the Cardinals got sloppy with the ball, Kentucky managed to regain its legs. Hord’s three-point play locked the two teams at 60 apiece. Just three minutes and change remained. Another turnover gave Kentucky the ball back with 2:22 left. With no shot clock to worry about, Kentucky coach Joe B. Hall went into a stall technique, hoping to take the last shot. Louisville tried to pressure the Cats, but the stall worked. After a timeout, with just 15 seconds left on the clock, Kentucky guard Dirk Minnifield got a step on his defender and went flying toward an undefended basket. His potential game-winner looked set to fall when Louisville’s Jones came from across the lane and swatted the shot away and into the hands of Scooter McCray. McCray started the break, passing to his brother who took a few dribbles then rifled the ball to Gordon, whose banked-in jumper gave Louisville a two-point lead with now only eight seconds remaining. Hall called timeout. The Wildcats inbounded the ball in front of the Louisville bench. Kentucky’s Master took the inbounds pass, passed it back to the inbounder and raced down the court. The Cats dribbled quickly into the frontcourt, exchanged a pass and then got Master the ball in front of the UK bench. He took one dribble to create space, jumped and with his legs splayed buried a 12 footer at the buzzer. The shot seemingly gave Kentucky new life. But the Cardinals, once burned, were not going to let that happen. Jones won the overtime tip and immediately the aggressive Cardinals tried to swamp Kentucky with their defense and athletic advantage. Gordon hit a fadeaway, then stole a pass and scored again. Kentucky coach Hall said later, “I saw it slipping away.” Two Jones free throws and then eight straight points from guard Milt Wagner put Louisville up by 14 and Kentucky was done. The Wildcats managed three late baskets, but the Dream Game had ended for them the moment Louisville won the overtime tap. The 80-68 final score didn’t reflect accurately the tenseness of the game, though it did show just how good the Cardinals really were. 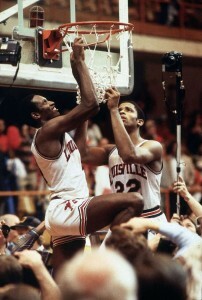 Lancaster Gordon (L) and Rodney McCray cut down the nets after Louisville's win over Kentucky. Gordon had finished with 24 points to lead all scorers. Kentucky was led by Turpin’s and Masters’ 18 each. More importantly, Louisville had forced the normally possession-conscious Wildcats into 18 turnovers, six by Minnifield, the UK point guard. After their slow start to the game, the Cardinals had caught fire, hitting 30 of their last 36 shots from the field, including an unreal 22 of 27 (81.5%) in the second half and overtime. Such were the stakes of the Dream Game. Kentucky fans across the Bluegrass, and indeed the nation, were forced to accept the viability of Crum and the Louisville program in a way they had previously avoided. But the Louisville win may have also had another, less intended, effect. There are many who believe that had Kentucky won the game, a regular season series might never have happened. Having brushed aside “little brother” up the Interstate, the proud Big Blue might have continued to pretend there was no rivalry. Instead, UK was more or less forced to schedule a yearly rivalry game. At least one who believes this theory is none other than Scooter McCray. It took more cajoling from both the bitter UK fans hungry for redemption and even a threatened legislative battle from the state capitol before the Kentucky Athletics Department finally acquiesced to scheduling a series. The first matchup in that series occurred the following November 26 at Rupp Arena, a Thanksgiving special that Kentucky won, 65-44. The two schools have met every regular season since, with the Big Blue owning a 20-10 record advantage. 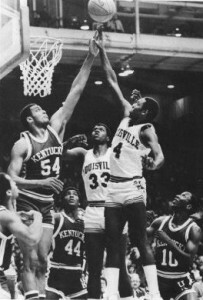 Just a season removed from the Dream Game, Kentucky got its tournament revenge, toppling the Cardinals in Rupp Arena in the 1984 Sweet Sixteen. They have not met in an NCAA tournament game since. This entry was posted on Wednesday, March 28th, 2012 at 12:31 pm by JWeill	and is filed under past imperfect, Regular Features. Tagged: denny crum, dream game, joe b hall, kentucky, louisville. You can follow any responses to this entry through the RSS 2.0 feed. You can leave a response, or trackback from your own site. Nice recap. Most people have forgotten that they should have met in the 1982 NCAA tournament. But it was Middle Tennessee State who upset Kentucky in the first round not UAB.